Did someone say something about an anniversary? No, not that one - this one: Wednesday is the 13th anniversary of Ask Leo!. As is tradition, I've compiled a few of the odd questions we get over on my personal blog: Lucky 13. Interestingly there are fewer odd questions than ever this year. I'M NOT ASKING FOR MORE. Something tells me that much the "oddness" in the universe that might be directed at me has been diverted into our presidential campaign. There's no shortage of it there, this year. With luck things will return to normal next year. And again, as always, I want to express my deepest gratitude to you for being here, for subscribing, and for just generally supporting Ask Leo!. It's an honor to be doing this, and I'm grateful every day for the opportunities I'm given. Full steam ahead into year 14! 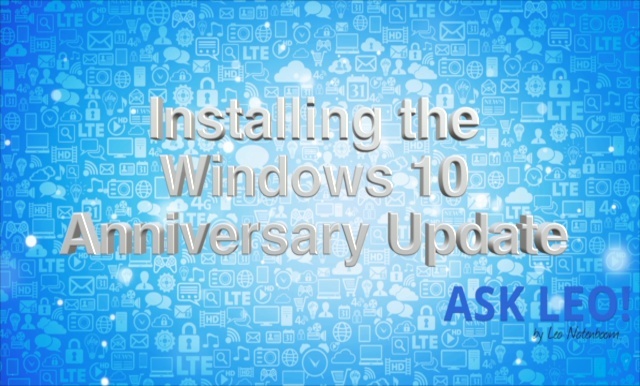 The Windows 10 Anniversary Update can be installed manually. With the help of some time-lapse video I'll walk through that process, quickly. When I get an email from someone that I do not want to ever hear from again, I report it as spam. What really happens to it? Does my email service know what to do with it if it ever shows up again? Is there any protection for me? Does the person that sent the email know that I put it in the Spam folder? There's no definitive answer on exactly what happens, for reasons I'll explain in a moment. However, some general concepts apply when you mark something as spam. The first thing we need to know is whether you're marking it as spam in an email program running on your machine, or if you're using an email service's web-based interface via your browser. Continue Reading: What Happens When I Mark Something as Spam? How are files "corrupted" and why do they go "missing"? I had this happen recently and was told that it was not a virus that caused it: that it "just happens". Whatever! Windows had to be re-loaded. Yes, it does "just happen". That should make you a little nervous and perhaps motivate you to invest in that backup strategy you've been putting off. The fact is, stuff happens. Things break. When things break, the failure can be catastrophic. Perhaps your machine won't turn on. Failures can also be much more subtle, not showing up for weeks or months, or perhaps never. Continue Reading: Why, or How, do Files Become Corrupt? While not specifically a technical term, the word ellipsis refers to the "three periods" that are often used to indicate that something is continued or hidden. In its simplest terms, an ellipsis simply means "there is more". Quite literally, three periods in a row – such as "…" comprise an ellipsis. I would also add two words to every conversation that every electronic media user should burn into their minds...NEVER AND FOREVER. And if you put it on social media you should expect it to be there FOREVER. PERIOD! I have a WD MyCloud device I use to back up 4 PC's in the house. It is connected to my router on a 1Gb port and works very fast. But it's designed to be always on so I guess I'm at risk of a crypto ransomware attack! Am I correct at thinking this? That any NAS device is at risk since it can be accessed via a possibly infected PC? Is there something software wise I can do on the WD MyCloud to deny access to this type of threat while still alowing my back ups? To be clear, only SOME ransomware reaches out to external drives or network connected drives. Not all - in fact perhaps even most - ransomware does NOT. The second best solution is to leave things as they are so that you get backed up regularly, and then periodically copy one or more of the backup images to a disk you then disconnect. The best solution is to not get infected with malware in the first place. :-) Remember, ransomware is "just" malware. Make sure you do what you need to do to remain malware-free. In my over forty years using and repairing computers, I have never seen a fatal failure of a hard drive. Just saying! It happened to me once. That would have been one time too many if I hadn't had a backup.